For me, eclairs have always been the kind of dessert that I don’t see often, but coming across it has always been a delicious treat. But when it comes to flavors, I’m all about a variety. 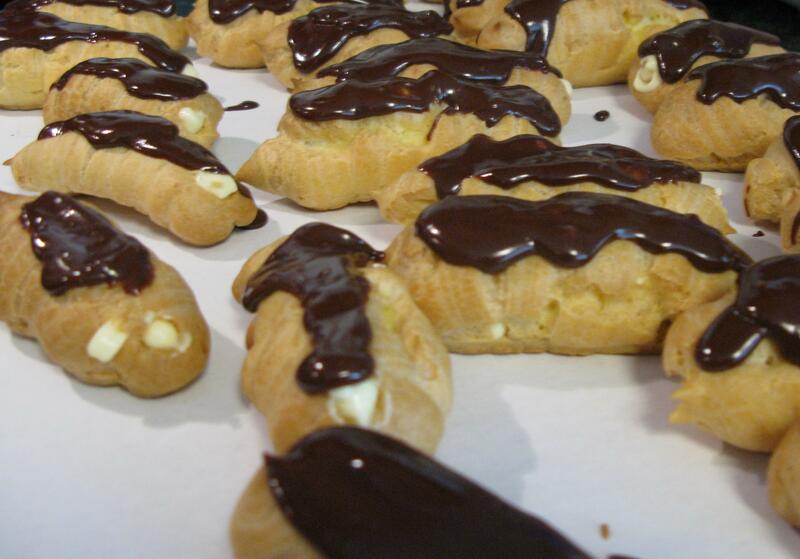 Here are the standard chocolate eclairs that I made for the first time, with the chocolate topping. These disappeared VERY quickly, and I only had one. My husband sees eating only as a requirement to survive (sure do wish I had that view sometimes), and when I made these, it seemed like every time I turned around, he was eating one. He is truly the ultimate test when knowing if a recipe is to his liking. I’d have to say that these definitely won. Second time around, I was thinking about the movie “Simply Irresistible” with Sarah Michelle Gellar. Their reaction to eating the caramel eclairs in this movie was memorable, and I wanted to try them for myself. Although they didn’t turn out to look exactly what they looked like in the movie, I’m determined to play with this recipe to make them look and taste for like them (well, taste like I THINK they do in the movie, since the actors have such a reaction to how delicious they are). Melt butter on high heat in sauce pan, add brown sugar and stir until dissolved. Slowly add cream, continue mixing and boil for two minutes, stirring constantly. Whisk until caramel is smooth. Let cool 2-3 minutes in pan, then stir in powdered sugar until dissolved (optional), and pour into a glass container to store. Make sure caramel sauce comes to room temperature before storing in fridge. Stores in the fridge for up to 2 weeks. For the icing, melt the chocolate and 2 tablespoons butter in a medium saucepan over low heat. Stir in 1 cup confectioners’ sugar and 1 teaspoon vanilla. Stir in hot water, one tablespoon at a time, until icing is smooth and has reached desired consistency. Remove from heat, cool slightly, and drizzle over filled eclairs. Refrigerate until serving. Mix together the egg yolks, egg, and the 2 Tablespoons of sugar. Add the cornstarch and flour to the eggs using a whisk. Mix until smooth and pale yellow. Set aside. In a saucepan over medium-high heat, combine the milk and remaining sugar. Heat and stir until the milk begins to steam. Pour half of the hot milk into a measuring cup. While whisking the egg mixture, slowly pour the hot milk (from the measuring cup) into the egg mixture and whisk till smooth. Pour the combined mixture back into the saucepan with the remaining hot milk (this is to prevent the egg from cooking) and bring to a boil, still whisking to prevent scorching; you will have some great wrists and forearms after all this! Remove from heat. Stir in butter and extracts. Transfer the pastry cream to the baking sheet and spread in a thin layer. Cover the entire surface with plastic wrap, pressing the wrap into the surface of the cream (smooth out as many air bubbles as you can). Then put into refrigerator and chill for about 15 minutes. Use immediately or store in airtight container up to 3 days. Combine pudding mix and milk in medium bowl according to package directions. In a separate bowl, beat the cream with an electric mixer until soft peaks form. Beat in 1/4 cup confectioners’ sugar and 1 teaspoon vanilla. Fold whipped cream into pudding. Preheat oven to 425 degrees F. Line two baking sheets with parchment paper. Heat the water, salt, sugar, and butter until the butter melts. Bring to a boil and remove from heat. Immediately add the flour and stir quickly with a wooden spoon, until smooth. Set the mixture over low heat and stir constantly for 4 minutes. Remove and allow to cool for 3-4 minutes. Add 1 egg and beat it thoroughly into the mixture. Add 3 more eggs, one at a time, beating well after each addition. Beat the 5th egg in a small bowl. Add this egg little by little, beating in between, until the dough becomes shiny and forms a string (by touching the batter with a finger and lifting away; a string should form). If it does not form a string when all of the egg has been added, add water 1 teaspoon at a time until it tests with a string. Fit a pastry bag with 1/2 inch tip, fill with dough and pipe thick fingers of dough about 3 inches long. Dip a fork in water and lightly make crisscrosses on each finger. Bake about 10 minutes at 425 and then reduce to 350 degrees F. Bake for 25-30 minutes. Turn off oven and prop door open slightly. 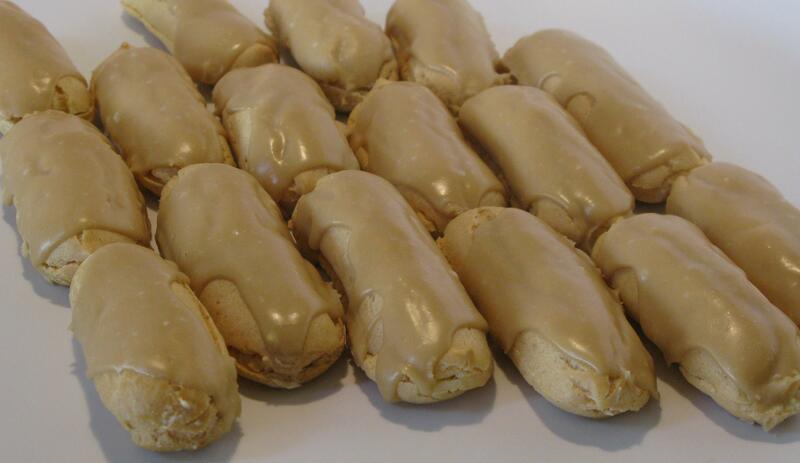 Allow the eclairs to stay in oven for 15 minutes. Transfer to wire rack. Remove pastry cream from refrigerator and stir to soften. Fit a pastry bag with a tip small enough to fit in the hole you made in the pastry. Fill bag with cream filling. Fill each pastry finger with cream. Remove caramel and chocolate sauce from fridge and warm to allow for easy dipping. Dip the tops of each finger into the caramel sauce, or spoon on top. Let excess drip off before turning over and dipping the next one.